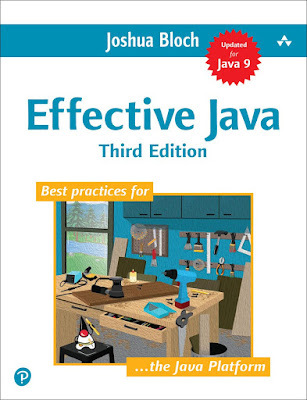 Hello guys, you might have heard about it that Effective Java 3rd Edition is finally available. After 10 years of the long wait by Java programmers from all over the world, finally, an updated version of, probably the most popular Java book on the planet is released now. This new version covers the features and paradigm introduced in JDK 7, 8, and 9. Joshua Bloch has done a great job in also updating most of the items to keep it relevant to the newer version. Apart from that, there is a whole new chapter added to explain best practices around Java 8 features. I know you don't need any reason to read this book, given its huge popularity and acceptance. Many startups which use Java, particularly in India, are also distributing copies of this book as a New Year Gift. As I told you before, I have pre-ordered this book in October itself and received my copy a couple of days ago, but I had already read most of the items, particularly the newer ones on my Kindle, where the e-Book (Effective Java Kindle Edition) was available ever since it was published on 28th December. I liked it very much and even though I did know about Java 8 lambdas, streams and how much they help you to write clean code in Java, Josh's advice helped me to fill some gaps. His chapter on Java 9 modules (Item 15) is also a great introduction to this essential JDK 9 feature, but it doesn't cover all of them. If you want to learn JDK 9 feature I suggest you better check What's New in Java 9 - Modules and More! course on Udemy. The number of items is also now increased to 90 from 70+ on Effective Java 2nd Edition. If you have read previous editions and are in little bit hurry I suggest you start with the new Items. There is a nice table at the start of the book which will give you a nice list of new items and which feature of Java 7,8, or 9 they cover. The best part of the book is that each Item is a whole chapter in itself which means either you can read the book from cover to cover or you can also read it Item by Item. I generally read it by Items and mostly during my commutes. I started with newer items and then looked at a couple of items suggested on the first pages which map to new features in JDK 7, 8, and 9. The Lambdas and Streams is the new topic which covers best practices of using lambda expression and stream API of Java 8. He has also covered Optional, Default methods on interfaces, and try-with-resource from JDK 7. If you have read the previous editions of Effective Java then you know that how valuable this book is for Java programmers. I always keep a copy at my desk, it not only looks good and impresses visitor but also helps me to refer it quite often. That has helped me a lot to use the Java in right way. It has also helped me to improve my code quality and structure of my code. As I told, you probably don't need any review of Effective Java 3rd edition to read this book. The title itself is enough to start with and if you are a passionate Java programmer like me, I bet, you already read it by now. 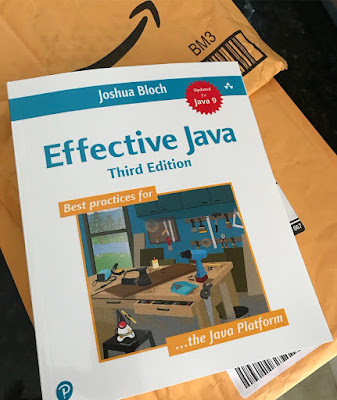 But, if you haven't read it yet, then start your New Year on a good note by reading Effective Java 3rd Edition this year. If you can't find paperback edition, don't wait for it. Just buy the Effective Java eBook and read it on your phone or tablet. The formatting of the book is excellent and you will get the same experience as reading a paperback book. Is Java Concurrency in Practice Still Valid in the era of Java 8? Thanks for reading this article, if you like this book then please share with your friends and colleagues. If you have any question or feedback please drop a note. Just bought this awesome book, can't wait to get in hand, reading eBook until then.